Successfully Added Rofvape Stalin E-Cigarette - 40Watt Output, 750mAh Battery, LED Power Indicator, 3ml Tank, Adjustable Airflow, 0.5-ohm (Brown) to your Shopping Cart. With the Stalin E-cigarette from Rofvape, you will be able to vape in style and enjoy your favorite vaping liquids to their absolute most. With its resistance of 0.5-ohm, this powerful vaper can handle plenty of Wattage thanks to which it offers great flavors and exceptionally large vapor clouds during your upcoming vaping sessions. Easy to operate and ready for usage straight out of the box, this vape kit is perfect for all starters out there – allowing you to smoothly get used to all the joy and benefits electronic cigarettes bring along compared to regular tobacco products. With its extraordinary design, this E-cigarette truly is an eye catcher that will grab the attention of your friends and people passing by. 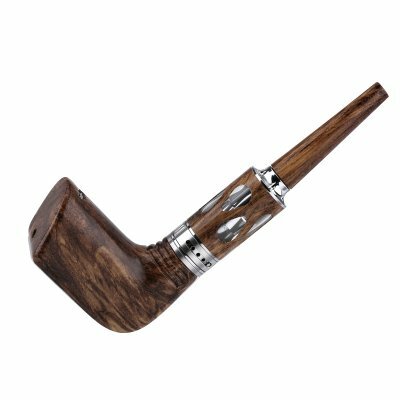 Crafted out of zinc alloy and finished off with a wood pattern cover, this vaper is not only durable – it also looks extremely stylish. Unlike regular vapers or e-cigarettes, the Witcher Stalin does not feature a bulky or cylinder design. Instead, it features an ''L'' shaped design which makes this vaper look like an ultra-modern tobacco pipe – truly allowing you to vape in style and turn the heads of everybody passing by. An additional nice feature of its design is that the atomizer features a see-through design – not only allowing you to see the remaining amount of vaping liquid left in your tank, but also adding an extra colorful and cool look to your cigarette while in use. Packing a sophisticated 750mAh battery, this E-cigarette holds enough juice for you to get through numerous of vaping sessions without needing to worry about running out of power. Additionally, this vaper also features 3 colorful LED lights that indicate its current power-level, ensuring that you’ll never run out of juice while enjoying a tasteful vape. Packing a 3ml tank, the Stalin vape mod allows you to use plenty of your favorite liquids through which it provides you every time again with a tasty and relaxing experience. Additionally, its air flow control allows you to further increase your experience by letting you adjust your vaping style exactly to your own personal liking. Along with its 510 thread connections, this vaping kit offers countless options and possibilities to fully enhance your vaping experience. Thanks to its beautiful design, this vape starter kit is the perfect gift that is sure to meet the likings of all vapers out there. Suitable for both beginning and advanced vapers, the Stalin vape mod is guaranteed to meet the demands of everybody out there. The ‘’Stalin’’ E-cigarette comes with a 12 months warranty, brought to you by the leader in electronic devices as well as wholesale electronic gadgets..